Big thanks to the lovely Shifa from Get Gawjus for guest reviewing this for me, go check the lovely lady out! I am probably the best guinea pig to test Lip Balms on, as even besides exam stress I have this annoying habit of constantly biting my lip – Yikes! But for some reason they do seem to recover somehow depending on which Lip Balm I use. 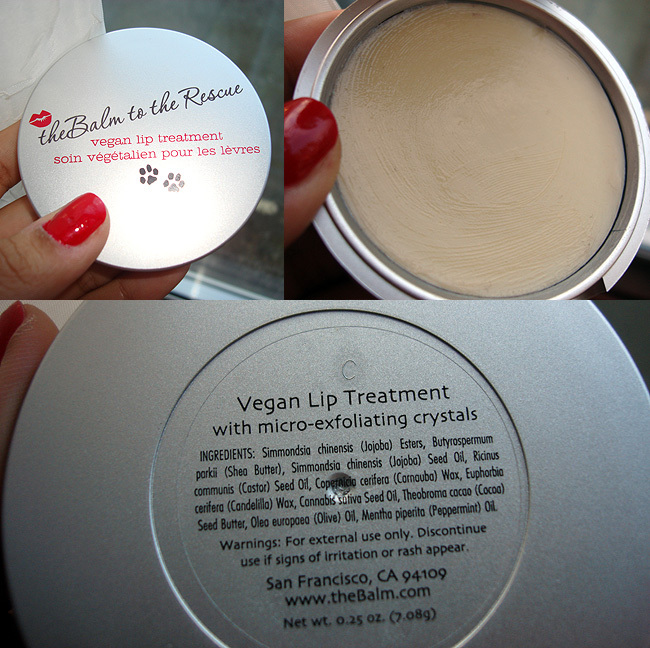 Here we have a super cute Balm ‘to the rescue’ which also happens to be a vegan lip treatment. It contains some interesting ingredients such as Jojoba, Shea Butter, Castor Seed Oil, Cocoa, Olive Oil and Peppermint Oil. Hence it does smell of peppermint but only on a sniff! Nothing strong as such. Another unusual thing I found with this is due to some contents, maybe Castor Oil, it does freeze at slightly lower temperature and becomes rock solid enough to be able to scrape product out of it. Also on a ‘hot’ London day I dipped my finger into it and it was literally of an oil-like consistency. So you have to be careful with storing this and keep it away from extreme climates. I haven’t noticed such changes in consistency with other drugstore lip products like Carmex and Vaseline though. Coming to the moisturizing effect, to me it delivers almost nothing! It is just as ordinary as any other lip balm in the market. It does not mend my lips like the Body Shop Lip Butter used to in a couple of hours. It sinks in unlike just sitting on the lips like Vaseline. The effect disappears within a few hours but it does leave me with soft and supple lips. The packaging is a winner all the way. A huge compact with a full sized mirror is quite refreshing for a lip balm. I love to carry this with me and apply it throughout the day as I don’t tend to wear any other lip products. Overall, I don’t hate the product but haven’t developed a profound love for it either. I would not recommend it to those with extremely dry, flaky lips as it won’t mend them as well. But I can definitely see this work with those with normal-dry lips or if you don’t mind splurging on high end lip products. You can get this for £10 from Zuneta and all net proceeds from this product are donated to Pug Rescue, so this is a great cause you will indulge in but I can’t guarantee if it will ‘rescue’ your lips for sure. This worked really well for me and completely made my lips healthy and looking good again when they were in a bit of a state when the weather was cooler. Sorry it didn’t work for you. Mine also melts terribly in the heat and goes all goo-ey which I hate, Which means I don’t like carrying it around when I am out and about, but I like to use it lots! I quite liked the fact that it didn’t just sit on my lips. it prevented my lips from getting dry but it didn’t moisturize all that much. I loved that it exfoliated my lips though. This seems to be the general response to The Balm overall, I think. Their products aren’t amazing but they’re not horrible either, just in this sort of beige nothingness in the middle.